Lab234 - Development, study and optimization of the superconducting phase locked Local Oscillator for integrated spectrometer. The objective is to develop and study a superconducting Local Oscillator (LO) for an integrated submm spectrometer. This task is successfully performed in tight collaboration of IREE, DTU, and SRON. As demonstrated by our team, a Josephson Flux Flow Oscillator (FFO) is the best-developed superconducting local oscillator for integration with an SIS mixer in a single-chip submm-wave receiver. Local oscillators based on Nb-AlOx-Nb FFO’s have been successfully tested from about 120 to 700 GHz (gap frequency of Nb) providing enough power to pump an SIS-mixer (about 1 mW at 450 GHz); both the frequency and the power of the FFO can be DC tuned. The frequency resolution of a heterodyne spectrometer is one of the major parameters for practical applications. In order to obtain the required resolution (of at least one part per million) the local oscillator must be phase-locked to an external reference. To allow phase locking, the free-running linewidth of the FFO has to be well below the effective bandwidth of the PLL (of about 10 MHz). During the last years detailed measurements of the FFO radiation linewidth are performed using a specially developed technique based on implementation of an integrated harmonic SIS mixer; the FFO linewidth and spectral line profile is compared to theory. A Lorentzian shape of the FFO line has been observed both at higher voltages on the flux flow step (FFS) and at lower voltages in the resonant regime on the Fiske steps (FS’s). It means that the free-running (“natural”) FFO linewidth in all operational regimes is determined by wideband thermal fluctuations and shot noise. This is different from many traditional microwave oscillators where the “natural” linewidth is very small and the observed linewidth can mainly be attributed to external fluctuations. It was found that the free-running FFO linewidth exceeds theoretical estimates made for a lumped tunnel Josephson junction. To explain the experimentally measured dependence of the FFO linewidth on its parameters, an additional term proportional to the differential resistance on the control line current (producing the magnetic field for the FFO operation) has been introduced to the noise model for a FFO. Recently a physical reason for such an additional term has been proposed. It is assumed that part of the DC bias current creates an additional magnetic field in the junction. Experimentally, dependence of the FFO linewidth on frequency is found; a possible explanation is proposed. The results of a numerical solution of the perturbed sine-Gordon equation qualitatively confirm this assumption. Abrupt increase of the linewidth at the FFO frequency of about 450 GHz is caused by the effect of Josephson self-coupling (JSC), which considerably modifies the FFO properties at voltages V @ VJSC = 1/3*Vgap (VJSC corresponds to 450 GHz for a Nb-AlOx-Nb FFO). 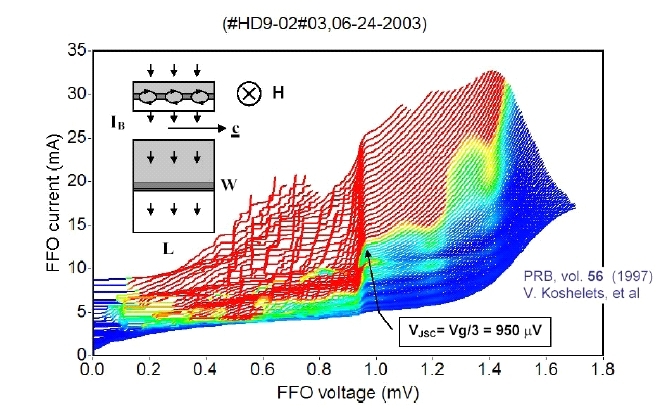 This increase of the intrinsic FFO linewidth due to the larger internal damping caused by the JSC effect at voltages V > VJSC and a considerable increase of the differential resistance just above VJSC significantly complicate phase locking of the FFO. Experiments demonstrated a considerable increase of the FFO linewidth with increase of FFO current density. Note that bias currents for all current densities are quite similar and their difference cannot explain the observed broadening of the FFO linewidth. It has to be noted that high current density (Jc ≥ 8 kA/cm2) is important for wide-band operation of an SIS mixer in the submillimeter wave range. It is found that an increase of the current density leads to the growth of differential resistances (instead of expected decrease! ); this creates a serious problem for design and development of SIR chips. Implementation of two separate trilayers with different current densities for the SIS mixer (high Jc) and for the FFO (lower Jc) might be a solution. To optimize the FFO design, the influence of FFO parameters on the radiation linewidth was studied. New modifications of the FFO layout have been proposed and optimized for the operation as a local oscillator in the TELIS microcircuits. A novel FFO design at a moderate current density has resulted in a free-running FFO linewidth from 9 to 2 MHz in the frequency range 500 - 700 GHz, that give us a possibility to phase lock from 35 up to 90 % of the emitted by FFO power. This relatively narrow free-running linewidth (combined with a wide-band phase-lock loop system) allows continuous phase locking of the FFO in the wide frequency range of 500 - 710 GHz. These results are the basis for the development of a 550-650 GHz integrated receiver for the Terahertz LImb-Soundinder (TELIS). intended for atmosphere study and scheduled to fly on a balloon in 2005-2006. TELIS will measure a variety of important atmospheric constituents within the lower stratosphere. In addition it will provide validation measurements for existing and planned spaceborne instruments and it will be an experimental platform for field testing of new sensor technologies. To be able to measure a weak signal next to a strong line, the PL FFO must have a well-defined line-shape. The ratio of the spectral power density at a frequency offset equal to the channel spacing in the spectrometer to the carrier will limit the dynamic range of the spectrometer. The phase noise of the PL FFO is about -70 dBc/Hz at 1 - 10 MHz offset from the carrier for fFFO = 680 GHz with an initial linewidth of 10 MHz. For a 1 MHz channel this gives a dynamic range of about 10 dB for the spectrometer. For an initial linewidth of 3.8 MHz the phase noise is below -80 dBc/Hz at 1 - 10 MHz offset (dynamic range of the spectrometer better than 20 dB). Typical set of IVCs for a Nb-AlOx-Nb FFO recorded with incremented magnetic fields. Note the abrupt change of the IVC at the boundary voltage VJSC ≈ 950 µV. 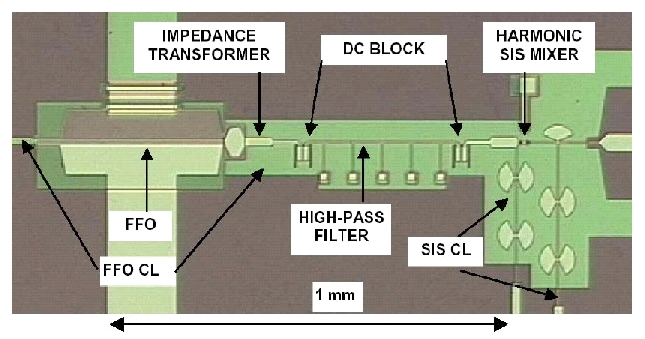 Central part of the microcircuits used for FFO linewidth measurements. FFO spectrum measured at 431 GHz (δf = 1.2 MHz) - dash-dotted line. The symmetrizated experimental data are shown by diamonds. Fitted theoretical Lorentzian and Gaussian profiles are shown by solid and dotted lines, respectively. the free-running linewidth is δfAUT = 6.3 MHz, spectrum analyzer span 100 MHz.